This 300S Blaster unit comes with a hot-dipped galvanized blast pot, stainless steel crash frame, control panel, plumbing and components, along with an integrated 115-gallon, UV-protected poly tank. 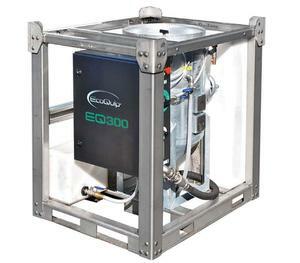 The EQ300S, when coupled with any air compressor capable of producing 185~350 cfm, has the ability to blast from 30~130 psi. The EQ300S comes standard with 50 feet of blast hose, pneumatic or electric dead man control, and a #7 nozzle. The unit fits in the bed of any standard pickup truck. The EQ 300S is currently ONLY available for purchase. Please contact us at 1-888-CJSpray (1-888-257-7729) to check on rental availability. Hose Length 50’, 1” ID, 4-ply blast hose weighs 60 lbs. * For the best production use performance media with a medium to fine mesh size. ** Please see complete warranty for details. Specification subject to change without notice. To purchase the EQ 300S, head over to www.CJSpray.com or call us at 1-888-CJSpray for pricing and custom packages. Rental info coming soon, call us for more info. Complete Machine for 1-Year From Original Purchase Date (necessary PM items excluded) Call one of our Spray Equipment Specialists at 1-888-CJSpray for additional information. EcoQuip® is a leader in providing abrasive blast equipment for the coating removal and surface preparation industry. Each system provides an eco-friendly method of abrasive blasting. With the ability to eliminate up to 97% of airborne particles while achieving removal rates comparable to traditional dry blasting, EcoQuip Abrasive Blast Equipment can improve the efficiency by minimizing containment and reducing project costs. Superior in technology, EcoQuip products are designed to be used in a variety of difficult environmental conditions like high-humidity, rain and even underwater. For more information on EcoQuip blasting equipment and accessories, head over to www.CJSpray.com. © 2015 CJ Spray Inc.